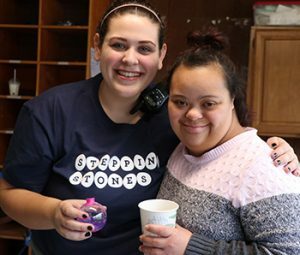 Teens and adults with disabilities enjoy short retreats at Stepping Stones’ Weekend Overnight Respites. September through April, the overnight recreational program allows dedicated parents and caregivers time to rest and re-charge while their loved one builds friendships, enjoys new experiences and builds independence. Weekend Respites welcome participants age 12 or older for a one or two-night stay at our Allyn Campus in Batavia, Ohio. The scenic, 46-acre property provides the perfect setting for a weekend getaway and includes accessible trails, lakes for boats and fishing, large program spaces and more. Standard staffing for Respite programs is 4:1 ratio. One-on-one staffing is no longer available for this program. For more information on Stepping Stones’ Weekend Overnight Respite program, contact Jeannie Ludwig at (513) 965-5108 or by email. The Weekend Respite program is currently in its off-season as Stepping Stones' leads Summer Overnight Staycations at Camp Allyn. Fall 2019 and 2020 Weekend Respite dates will be announced in early July. If a participant needs to be absent for any reason, please notify the Program Coordinator via the Attendance Hotline.